Government Service Tax @ 4.50 % additional on above rates. 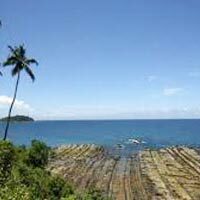 Arrival at Port Blair in the morning/afternoon by flight and transfer to hotel. 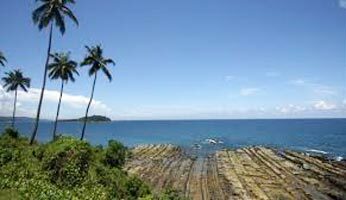 Relax and rest at the hotel and after lunch visit the famous Cellular Jail*(a witness to the freedom struggle) and then visit the Corbyns Cove Beach - the only Beach in Port Blair City. In the evening proceed to attend the enthralling Sound and Light Show (at 1800 hrs or 1900 Hrs, depending on light and sound show ticket availability) at Cellular Jail - where the heroic saga of the Indian freedom struggle is brought alive. Morning at leisure. Checkout Hotel and keep luggage at reception and after lunch proceed to visit Kala Pathar beach a scenic beach involving a wonderful ride by the coast, spend a hour and then return from Havelock Island in the evening by Govt ferry and transfer to hotel in Port Blair. Evening at Leisure. (Do note that all hotels on Havelock have a early morning check out time and late check out is provided at the discretion of the hotel management) Request you to kindly carry the luggage and proceed to Kala Pathar Beach. After breakfast, start for a tour of places in & around Port Blair (City Tour) - Chatham Saw Mill (one of the oldest & largest in Asia), Forest Museum, Anthropological Museum, Fisheries (Marine) Museum,Naval Marine Museum (Samudrika) After lunch visit Ross Island* (Wednesday Closed) which is about 2 km east of Port Blair and can be reached by a short boat ride from Water Sports Complex (Ferry leaves at 1400 hrs and returns at 1600 hrs). The island is controlled by the Indian navy, which requires every visitor to sign in on entering. In the evening visit the market for some local shopping.